Portela is a civil parish in the municipality of Loures, in the district of Lisbon. It was a masterplan deeply inspired by modernist that is located close to the airport and enclosed by freeways. The upper middle class inhabits this neighbourhood. 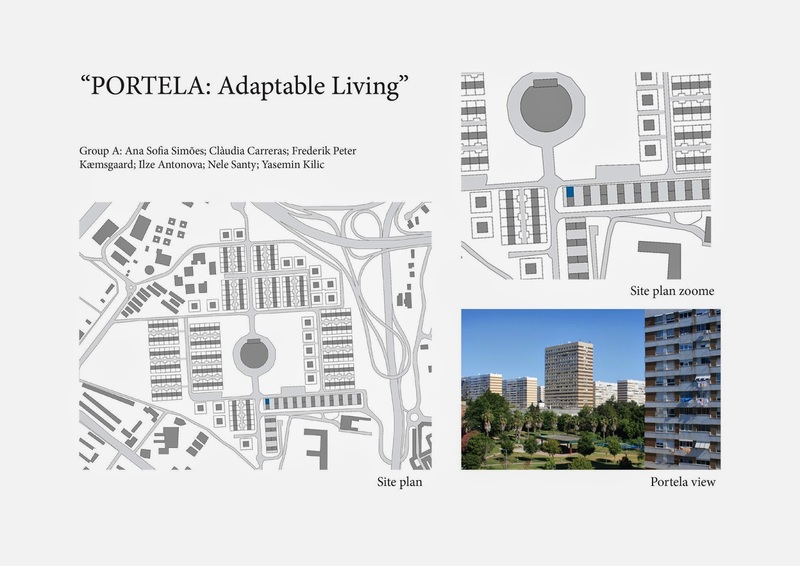 The proposal takes into consideration the profiles of the possible inhabitants, but we do not the proposed spaces -which aimed at fostering community living within a block- would satisfy their demands and expectations. The link beween actual needs -identified through interviews, sociological studies- and the architectural proposal is missing in the information provided. The architectural proposal is based on the creation of reinforcing the communal character of the circulation spaces, extending them from the staircase to the external corridor that gives access to the housing. These communal spaces are also connected vertically, giving rise to a space which would become the "center" of the refurbished building. This is a very powerful concept which would require some drastic transformation in the structural skeleton but it is nevertheless feasible, from a constructive point of view. The site analysis in relation to sociological studies and statistics regarding characteristics of inhabitants shows in general the understanding of sociodemographic tendencies by the students and has led to a realistic approach of design methodology. The categorization of residents is generic and further connection to proposal would reinforce the team's posisition. Portella blocks analysis is holistic investigating various parameters. Some of the interventions (like on the edge of the balconies) might not be structurally feasible but the space condition they create generates differentiation and interaction between the various families. Nevertheless such interaction might not be desirable in all instances of the private exterior space of each flat (balcony) thus privacy could be controlled with other means.Rich presentation with clear plans and sections as tools of representation.